I Don't See Any Color In Auras? The Astral Pulse > Metaphysics > Welcome to Metaphysics! > I Don't See Any Color In Auras? I've always been able to see the existence of auras, but to me they appear not as colorful surroundings that I can 'read', but rather I can see them based on how they effect the way the environment looks. I see that they have many layers, which are distinct but meld into each other, but the way they actually look I'd describe more in terms of 'noise' (The kind of noise that is on 'fuzzy' tv channels, if you do graphic design, you know what kind of noise I'm talking about) and the layers are dictated by the density of the particles. 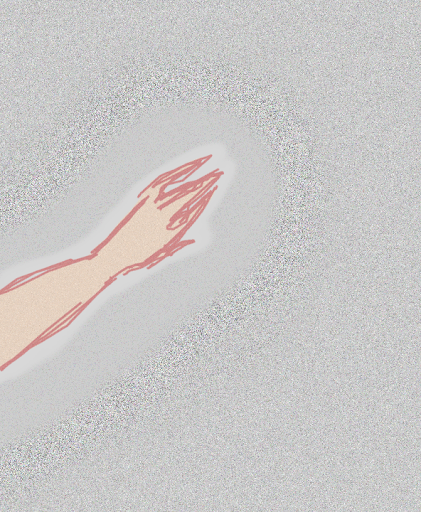 I really quickly sketched what I'm talking about around a terribly mouse-drawn hand in a photo editing program, just so it makes a bit more sense. Sometimes the outer band has a tiny bit of color, but it's not that I'm seeing any color, it's just the idea of color that I'm perceiving. Does anyone else see them this way? How can I view them in color? Re: I Don't See Any Color In Auras? Hey your doing good to post a photo in here. That is kinda tricky. Okay now about the auras. I don't see spirit color very well with my phyisical eyes. I tend to feel and taste colors when it comes to spiritual appearances. This is a form of synesthesia and it's common. You can probably sense colors with another sense if you work with the awareness. Feeling the colors is a gut knoweledge or a hunch. At first it feels like your making it up. You get better with practice. Here's the hard part to get your head around. The whole aura thing is basically an illusion we generate that symbolizes what we sense in that other person through our connection with " the system " or the source or whatever you want to call it. Because of this it's highly subjective as to how it appears and what those appearances mean. That is something you have to figure out for yourself. You can practice with photos and videos of people. You tube is your friend. Watch the moods and changes in the " aura" don't judge the changes just describe them. Write them down as you are doing this. Thanks so much, that makes a lot more sense. In books it seems so often the authors boast about auras as being 'so beautiful, and vividly bright and colorful' all the time, it gets confusing. I appreciate you clearing that up. I don't see colours either. Perhaps, instead of colours, you use "other" ways of seeing... like perhaps, density? I've noticed that's how I see things instead of in colour. I'll see an area that looks more dense compared to the rest of it. It's all unique and individual to you, so who knows. I don't really rely on auras to assess a person's state. I do better with more of a psychometric type feeling or sense. psychometry does not mean you have to be in contact with any object. Focus is sufficient to move the ability to where ever and when ever you want. Same with vision. I was scrying a couple days ago doing a precognition prediction using ARV techniques for the football game on Sunday. I actually recorded the name of the associated photosite which was a windmill before I drew it in the scrying session. I had noticed the order of sensory information with the hearing but now I have the sequence documented on paper. Wow, I'd never thought about it like that before, I think that might be it! I've read about auric vision being able to determine spiritual and physical ailments/blockages, in your experience, does the denser matter denote something negative, or something positive? I have noticed every so often that the shape and density of an aura changes in certain situations, for example, I play the keyboard in a church band, and when I look out at the auras of the congregation, I can see that there is a less dense- less dense than the surrounding environment itself- area in their auras which extends from the center of the scalp, or crown of the head, up, in a cylindrical shape that expands outward the closer to the parameter to the auric shell it is. It does not extend past the auric shell itself. Have you ever seen anything like that, do you know what it means? That would be entirely up to however you decide to interpret it. It's not my place to tell you that. When you see differences like this in someone's aura, try asking them about something regarding their emotional state or that specific area. I have never personally delved too deep into it. I just know I can see it. I used to have this problem so maybe this will help: there are two ways of seeing one's aura. You can either see it with your actual eyes or you see them in your mind. With your actual eyes, 99% of the time you will see distorted air or "colorless" aura-like energy. With your minds eye (AKA imagination or thoughts), tell me what's the first thing that comes to mind? Is it a color? A shape? Not all aura readers see auras in color all of the time. Sometimes, you can see the texture or maybe the density of the aura. You'll learn that there isn't really a clear way to read auras. You can "feel" out someone's aura (or your own) if you're an empath. Otherwise, do exercises where you place an object in front of a white surface (like a wall or a piece of white paper) and try to "see" the color in your mind instead of your actual eyes. Overtime, you'll get results through practice and patience. Hi, I know this post was from a while ago, but what your seeing is the electromagnetic field being generated by the Aura, not the electromagnetic SPECTRUM of the Aura itself. The field is the waves your seeing extending outwards, theres different density layers in the field that are proportional to the speeds of the photon particles that refract within each spectrum of colour in the individuals Aura. The colour itself is the spectrum. But the spectrum and the field have seperate distinctions in visual frequency, in other words different extrasensory vision for for the two aspects. Some people see the actual EM Spectrum of the Aura, some people see the EM field, some see both. I have seen colors and pretty much very similar to that graphic you posted. When I do see color, I see it in very close family members and it looks like colors shoot out of their head. I also tend to see it when they are emotionally distraught. Often looks like a cloud around the eye area. The other times I have been able to see color was when someone was walking in front of a white board. In university classes I always had fun staring at my teachers heads because I could see like a light green or red aura coming off of them. However, all in all it is always the colorless energy field and I see that on almost anything, plants, cars people etc. Normally it just pops up randomly. And I don't take much notice of it.